Main purpose of this report is to analysis Front Office Operation of The Westin Dhaka. Report mainly focus on to know about Front Office department of The Westin Dhaka and discuss about different Methods and Techniques of Office Operation management. Other objectives are to know the operational aspects of a 5 star hotel and finding out some problem and prospects Office Operation management system. Know about Front Office department of The Westin Dhaka. Discuss about different Methods and Techniques I learned there. Finding out some problem and prospects. Although there were so many limitations, I tried to use both the primary and secondary sources of collecting information to make the report presentable with as minimum abstraction as possible. Secondary data: Data that were published before for some other reason can be collected using internal and external sources. Internal Secondary Data: To furnish the report properly some data has been collected from the officials of The Westin Dhaka. Information from annual reports, journals, newspaper and other published documents have been used. External Secondary Data: For better interpretation some data has been collected from Bangladesh Parjatan Corporation. Different E-books and web sites were the main source of information for this report. 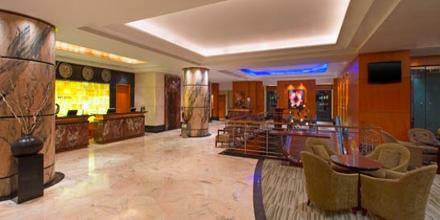 The Westin Dhaka is the first generation renowned hotel. It has a huge branch operation worldwide. The current study aims are to get acquainted with the organizational structure of The Westin understands and orientation of application of the theoretical learning acquired from conceptual concentration in the undergraduate program. The major objectives of this study are to determine how a front office deals with visitor and the revenue earning sources. To identify the pattern of revenue sources elements. One recommendations and suggestions have been made to improve both the pattern of front office revenue and the trend of earnings from various resources. To this aim, I have collected the data & information collected through primary & secondary sources. My dissertation is the Front Office Operation of The Westin Dhaka. I have collected the primary information through face-to-face conversation and interview with officials of The Westin Dhaka, data from Computer generated database etc. Secondary data are collected basically from observation & collection from Journals, Brochures, Annual Reports, Paper, internal documents, Magazines, Publications, Books and others form of publications as well as websites. From the collected data and information I execute the trend of the earning and income from total revenue. I have also executed the interdepartmental communication. I have also show & analysis the guest invoice. Commercial establishment providing lodging, meals, and other guest services. In general, to be called a hotel, an establishment must have a minimum of six letting bedrooms, at least three of which must have attached (ensuite) private bathroom facilities. Although hotels are classified into ‘Star’ categories (1-Star to 5-Star), there is no standard method of assigning these ratings, and compliance with customary requirements is voluntary. A US hotel with a certain rating, for example, is may look very different from a European or Asian hotel with the same rating, and would provide a different level of amenities, range of facilities, and quality of service. Whereas hotel chains assure uniform standards throughout, non-chain hotels (even within the same country) may not agree on the same standards. In Germany, for example, only about 30 percent of the hotels choose to comply with the provisions of the rules established by the German Hotels & Restaurants association. Although both WTO and ISO have been trying to persuade hotels to agree on some minimum requirements as world-wide norms, the entire membership of the Paris-based International Hotel & Restaurant (IH&RA) opposes any such move. According to IH&RA, to harmonize hotel classification based on a single grading (which is uniform across national boundaries) would be an undesirable and impossible task. As a rough guide: A 1-Star hotel provides a limited range of amenities and services, but adheres to a high standard of facility-wide cleanliness. A 2-Star hotel provides good accommodation and better equipped bedrooms, each with a telephone and attached private bathroom. A 3-Star hotel has more spacious rooms and adds high-class decorations and furnishings and color TV. It also offers one or more bars or lounges. A 4-Star hotel is much more comfortable and larger, and provides excellent cuisine (table d’hote and a la carte), room service, and other amenities. A 5-Star hotel offers most luxurious premises, widest range of guest services, as well as swimming pool and sport and exercise facilities. Front Office: It is the most important department of the hotel. The main function of this department is to give warm welcome to the guest. It helps to create good image in front of the guest. This is the first department where guest comes in contact with. It generates the maximum revenue for the hotel as it sells room to the guests. This also includes sub departments like reservation, Bell desk, and Information desk. It also provides some facilities like concierge service to the guest. Food and Beverage Service: It is a department which serves food and beverage to the guest in a very attractive and pleasing manner, which creates good impression on the guest. there are several kind of food and beverage outlet like restaurants, Bars, Coffee shops, take away banquets etc. It is second most revenue producing department of the hotel by selling different types of food and beverage to the guest. Housekeeping: This department is responsible for cleaning and maintaining hotel premises which include public area, guest rooms, lobby, swimming pool area etc. generally this department is not visible to the guest. It works for guest satisfaction through keeping the environment clean and hygiene. Horticulture is one of the most important features of housekeeping department which deals with different types of flower arrangement and maintaining the garden. This department works to give pleasant look of the hotel to the guest. Food Production: It is a department with deals with the preparation of different types of food items. It is not a visible department to the guest because it usually works in the back area. It makes the food more delicious and attractive by different styles of cooking method. Different cuisine has their own kitchen and specialized chef to work on it according to their skills. Bakery departments comes under this which include preparation of desserts, breads etc. Those are seeking a healthier lifestyle in the most relaxing of surroundings, Westin Workout offers a fully equipped gymnasium including personal trainers, sauna, steam room and professional massage treatments. Recreation enthusiasts will enjoy the impressive swimming pools, tennis and squash courts. Swimming, tennis and squash lessons for children and adults are conducted by our professional and skilled instructors. Beauty packages, bridal make-up, skincare, haircuts, facials, manicures, pedicures and other beauty treatments are available on the 3rd floor of the Courtyard building. Guests are provided with complimentary tea and coffee in Savvy Beauty and Barber Salon. An Overview of The Westin Dhaka. Westin Hotels & Resorts® redefine efficient service with an effortless style and gracious attitude that ensures a truly unforgettable experience. Welcoming yet never overwhelming) .Westin Hotels & Resorts are architecturally inspiring, thoughtfully designed and located in the world s most exciting cities and sumptuous resort destinations. It has more thall170 hotels and 30 resorts in over 43 countries and it has total of more than 74,461 rooms corevalues are Personal, Instinctive and Renewal. Westin Dhaka will exceed customer expectations and service, quality and value maintaining a safe and clean environment honoring the dignity of all associates contributing to the community and ensuring maximum return to the owner. Westin recognizes that behind every reservation is an individual with a unique set of needs. We customize care and attention on all guests to create an intimate and individualized experience. Westin pro actively anticipates guests’ needs instead of simply reacting to them. Our culture inspires associates to unleash their own- personal judgment and engage with guests to intuitively and proactively recognize and responds to their diverse needs. Recognizing the rigors of the road Westin is a retreat offering tranquility and rejuvenation. Whether alone or in and energized environment with others, the array of services and special touches help restore the body. Refresh the mind and elevate the spirit. The aim is for guests to check out not only rested, but also renewed and enriched. Relax, revive, and experience renewal at The Westin Dhaka – the newly opened five-star hotel in Gulshan. Nestled in the new business district, we are steps from renowned shopping malls, foreign missions, restaurant, art, private clubs, and multinationals. Our hotel is also only eight kilometers from Zia International Airport. .
All 235 beautiful guest rooms, including 23 suites and a Presidential Suite, feature the world-renowned Westin Heavenly Bed@ in addition to state-of-the-art workstations with telephones; four-fixture bathrooms, High Speed Internet Access, and plasma TV with satellite channels. The Executive Club floor offers the grandeur of Westin service standards with complimentary breakfast; afternoon tea, and evening cocktails. .
Our hotel offers five contemporary meeting and conference venues including The Westin Grand Ballroom with LED lighting effects and projectIons. From a fully serviced business centre to our health and fitness centre featuring the Westin WORKOUT@ Gym, we fulfill the requirements of modern travelers. Find unique culinary experiences at our numerous restaurants. Dishes are created with the freshest of ingredients, including preparations from live cooking stations. Address: plot 1, cwn (b), road 45 main gulshan avenue, gulshan 2 dhaka – 1212, Bangladesh. Total land area: 1,600 sq.m (17,325 sq.ft). Total floor area: 32,000 sq.m (3, 44,600 sq.ft). Our exclusive business centre offers a wide range of services, including copying, printing, and fax services, as well as a self-service PC and Internet access. Wireless Internet access IS also available in all public areas and meeting spaces. Reenergize in our state-of-the-art Westin Work-Out that features top-of-the-line fitness equipment including cardiovascular equipment, weight machine, Jacuzzi, sauna, steam room, and temperature controlled swimming pool. Restore your body and mind in our spa with our signature treatments custom-designed to nurture you. Guest can enjoy the unique culinary experiences at the numerous restaurants from the freshest of ingredients including preparations from live cooking stations. Front office is a term used in hotels to cover the various sections which deal with reservations, room allocation, receiving, check in, check out, billing and payments. Front office is only one of the departments within a hotel, as is obvious from the generalized. The most important outcome of the reservations process is having a guestroom ready and waiting when the guest arrives. This guestroom should not be just any room, but the room that best meets the needs the guest expressed during the reservations process. At the same time, the hotel manager and owner have different objectives for the reservations process. They would like the reservations process to provide the highest occupancy and room revenue possible. Determining room and rate availability. Researching, planning, and monitoring reservations. The majority of hotel guests make reservations. Reservations may take many forms. A brief discussion of the major types of reservations provides some important distinctions. Registration begins when front desk agent extends a sincere welcome to the guest. A warm greeting sets the tone for everything that follows. The front desk agent moves into the registration process after determining the guest’s reservation status. To a great degree, registration relies on the information contained in a reser­vation record; front office personnel will find registration simpler and smoother when accurate and complete information has been captured during the reserva­tions process. After a guest arrives at the hotel, the front desk agent creates a registration record, a collection of important guest information. The receptionist must be a sales representative at all times. He guest must have a through knowledge of the product they sell, details of the hotel, rates, service and facilities. An effective guest accounting system consists of tasks performed during each stage of the guest cycle. During the pre-arrival stage, a guest accounting system captures data related to the type of reservation guarantee and tracks prepayments and advance deposits. When a guest arrives at the front desk, the guest accounting system documents the application of room rate and tax at registration. During occupancy, a guest accounting system tracks authorized guest purchases. Finally, a guest accounting system ensures payment for outstanding goods and services at the time of check-out. It resolves outstanding guest account balances. It updates room status information. It creates guest history records. Guest account settlement depends on an effective front office accounting system that maintains accurate guest folios, verifies and authorizes a method of settlement, and resolves discrepancies in account balances. Generally, the front office finds it most effective to settle a guest’s account while the guest is still in the hotel. A guest can settle an account by paying cash, charging the balance to a credit card, deferring payment to an approved direct billing entity, or using a combination of payment methods. Regardless of whether the guest intends to pay by cash, check, credit card, or other acceptable method, the hotel should take precautionary measures to ensure pay­ment. Effective account settlement depends on the steps taken during registration to determine the guest’s method of payment. The establishment of proper settle­ment or credit authorization at the time of registration will greatly reduce the potential for unauthorized settlement and subsequent collection problems. Checks front office accounting records for accuracy and, on a daily basis, summarizes and compiles information for the hotel’s financial records. Tracks room revenues, occupancy percentages, and other front office operating statistics. Prepares a summary of cash, check, and credit card activities, reflecting the hotel’s financial performance for the day. Posts room charges and room taxes to guest accounts including guest transactions not posted during the day by the front office cashier. Processes guest charge vouchers and credit card vouchers. Verifies all account postings and balances made during the day by front desk cashiers and agents. Monitors the current status of coupon, discount, and other promotional programs. Is able to function as a front desk agent especially in terms of check-in and check-out procedures. Service centre is the telephone based command centre of the Westin Dhaka. Most of the guest service will be done through service express. The service express associates are to be multi skilled and the most efficient as they need to work with all the department of the hotel and need to know everything about the hotel and the surrounding to provide all guest requirements. That is why it is also called the “heart of the hotel concierge”. It is the one point of contact for the guest for any service and information. Provide the guests with a personalized service team responsible for expediting their requests for service, no matter what the request. The Executive Lounge will be open from breakfast time serving a smaller selection of breakfast and evening canapés or Cocktails for the Club Floor guest and suite staying guest. No outside guests are allowed in this lounge. The Club Floor Lounge on the 21st floor offers unparalleled luxury with an inviting, intimate atmosphere where all your needs will be taken care of by our dedicated attendants. We have designed this private lounge with only one purpose in mind – to offer you a luxurious oasis of peace and relaxation. During each shift any relevant information, issues, events or guest complaints must be recorded in the Concierge Desk Log Book. Both incoming and outgoing shifts must sign the Log Book to indicate that the handover has taken place and that the logbook has been read. A doorman must be posted at the entrance of the hotel at all times. As a car pulls up, once it has stopped open the passenger’s door and say “Welcome to The Westin Dhaka!” Help the guest from the car if necessary (i.e. elderly, people with shopping), and ask if they have any luggage, it will, on occasions, not be obvious or when the taxi driver will open the boot. If the guest is checking in, find out their name and take them to the reception desk and introduce them to the receptionist. Another Bellboy will be unloading the luggage and moving it into the lobby and awaiting a room number if one has not been allocated. If the guest is just using the facilities then direct them to where they wish to go. The receptionist will inform the Concierge of the guest’s room number. Write down the time, bellboy’s name, and pieces of luggage in the delivery log book. Go up to the room using the Service Elevator, allowing time for the Receptionist to show the guest the facilities of the room. If arrive up to the room and the Receptionist is still talking to the guest, knock, excuse, and place the luggage on the luggage rack, keeping the luggage trolley against the wall. Place the luggage on the luggage rack and wish the guest a pleasant stay. Leave the room. If the guest is not in the room, let in with the master key and leave the luggage neatly on the luggage rack. Once the bus arrives, unload the luggage quickly and carefully from the bus and place them in rows. As the bags are being unloaded with the finalized Group Rooming Sheet move through the bags, taking a note of the name on the bags and the room number of the guest. Once you have found the guests name, place a pre-prepared Radisson luggage tag with the room number, attached to the handle. Using a trolley, stack the luggage together that are going to rooms close together and on the same floor. Take them straight up to the rooms using the elevator. When on the accommodation floors, always act quickly and quietly, keeping the luggage trolley against the wall. Knock on the door three times, announcing “Concierge” and when the guest opens the door say “Good Morning Mr/Mrs/Miss “X”, (you will be aware of the name as it is on the tag) I have your luggage”. Place the luggage on the luggage rack beside the wardrobe and wish the guest a pleasant stay. Follow up with Reception as to satisfaction of the group – if he/she has received any complaints or if there has been any last minute room changes. Once the Operator/Business Center Agent gives a message to the Concierge through the telephone, the concierge must pick up the message/fax from the Service Express. Write down the time, Bellboy’s name, and items to be delivered in the delivery logbook, and the room number it is going to. The bellboy must go with the messages/faxes up to the room immediately. The bell boy must knock on the door and announce “Concierge” and slip the envelope under the door. Either a guest (or the receptionist) will telephone asking you to pick up guest luggage as they are checking out. At this point, confirm the room number and query on how many pieces of luggage they have. This is so they can decide to take a trolley if required. They also need to know if the guest would like their luggage stored, put into their car etc. Log the information in the logbook; stating the time, pieces of luggage, room number, and Bellboy allocated to the task of collecting the luggage. If the guest requests luggage to be picked up, the Bellboy must inform other bellboys/doorman so that any potential walkouts can be identified. Take a trolley if necessary, and make way up to the guest’s room using the service elevators. At the guest’s room knock on the door and announce “Concierge”. If the guest is in their room say “Good Morning Mr. Smith, may I take your luggage and store it in your car?” etc. Always leave the trolley outside the room. If the guest is not in the room, enter the room move the luggage onto the trolley and quickly glance around the room to make sure you have not left anything behind. Transport the luggage back to the lobby and place it either in storage, in the guest’s car, or have it ready to load into a taxi, if the guest is in the lobby and checking out. The business center at The Westin Dhaka ensures that secretarial and translation services and business support – from computers, printers and scanners to high-speed Internet access, photocopying and faxing facilities – are readily available. At The Westin Dhaka business center facility is world class. Secretarial service and information library on local commerce, industry. A boardroom and private office for rent. Printing (Both black & Color). This meeting space, at the lobby level, offers a fixed boardroom-style meeting setup and can accommodate 12 guests. This room is approximately 450 square feet in size and is situated at Business Centre. The rent for Business Center Meeting Room is TK 2000++ (10% service charge & 15% government tax) per hour. The biggest hotel in the main Gulshan Avenue having 235 rooms. A huge car parking area providing 300 vehicles parking. Well stocked bar with wide range of international liquors. Bank branch inside the hotel premises. Business center with broadband Internet facilities. A large ballroom, capacity to accommodate 1200 person. Board meeting room, 30-person capacity. Most of the staffs are not from hospitality background. Most of the time decisions come from STARWOOD head office. Chain of command is not exercised properly. Still now some projects remain Incomplete. Local market can be targeted for restaurants and shopping complex. Introducing packages during the off pick season. Giving more emphasize on packages can maximize revenue. Some international hotelier groups also showing their interest to establish hotels and resorts within the area, like Dhabi Group of United Arab Emirates has already declared to build a world-class hotel There are few three star category hotel in Gulshan area. and resort in Dhaka. There are few three star category hotel in Gulshan area. No idea whether they have competition or not. Lack of supply of trained manpower in Bangladesh. Motivation and rewarding approach in not seen while many small and similar properties provide commission to front office staff whom for the room night sale. Maintenance department is not capable for maintaining the hotel property for that reason any time big danger might come. Lack of government interest towards the development of the tourism. Weak communication with the other hotels. Associates should have the right attitude and the manners. In terms of physical resources, required a large number of security devices. Advanced software to keep track of all the guests. Hotel needs strong and efficient infrastructure to continue its operations. The Westin Dhaka is a new five-star hotel, conveniently located within the prime diplomatic and commercial zone of Gulshan. The embassies, high commissions, multinationals offices, and shopping malls are within easy walking distance. As per we know about hotel industry in the world it’s one of the most popular and marvelous businesses in the whole world. In past it was too little and minimum business but now a day it highly income and maximum business in the world. Because we know that as a human being every one should go to another place for their recreation and have fun, do enjoy the environment and anything else. We know also that the people like to have enjoyed and visit heritages and some other beautiful places.